I recently began using a web browser called Qutebrowser. I heard about it on Hacker News a while ago and it caught my attention because it encouraged a completely keyboard-based workflow. I’ve been surprised at how much I’ve enjoyed using it and it may very well become my primary web browser. In this post, I will talk about how I got started with Qutebrowser, what makes it unique, which of its features I love the most, and what future features I’m most excited for. I’ve been using Google Chrome or Chromium for almost as long as I can remember. My first introduction to the web was through Microsoft’s Internet Explorer on my family’s shared home computer running Windows 95. When I was in Junior High, I discovered Firefox and quickly jumped on the anti-IE bandwagon, although at the time, I didn’t really understand why everyone hated IE. In 8th grade, I heard about Google Chrome and became instantly infatuated with it’s sleek look and claims of performance gains. I continued using it throughout high school until I started running Linux and switched to Chromium since it seemed to be more trendy in the open-source community. Since first using Chrome/Chromium, I’ve tried about a half dozen other browsers, but never for more than a few days. I’m always excited to try out new things, and with how central my web browser is to my daily life, I’m interested in finding the most optimal one for my personal workflow, but I never found one that could match Chromium in speed, extensibility, reliability, and features. A feature that is important to me is support powerful and flexible custom keybindings. I’ve tried to move as much of my work from my mouse to my keyboard as possible, and almost all of my time on my computer is spent either in a terminal or in a web browser. With Chromium + Vimium/cVim, I was able to get pretty close to being fully keyboard based, but while Vimium and cVim are great extensions, they are still just extensions, extending a tool that was designed to be used with a mouse. There are a lot of essential (for me) features that they are not capable of implementing because of Chromium’s limitations on what extensions are allowed to do. 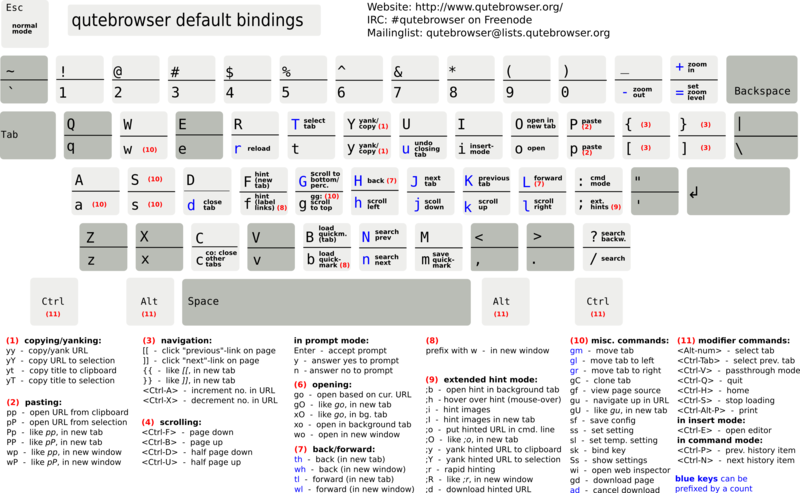 Qutebrowser describes itself as “a keyboard-focused browser with a minimal GUI”. It has vi-inspired modes and keybindings for interacting with both the browser itself and the webpages that you are browsing. It’s possible to do just about everything you ever need to do in a web browser without touching the mouse/trackpad in Qutebrowser. Like I mentioned, I am a huge fan of keyboard-based workflows, so this immediately caught my attention when I first discovered Qutebrowser a few months ago. Since trying it out for the first time, I’ve been using it almost exclusively. There are a lot of things that I really love about Qutebrowser and I will cover the ones that are most important to me in the following sections. A primary focus of Qutebrowser is a completely keyboard-focused workflow. The default keybindings are quite nice, in my opinion. There is a helpful cheatsheet that came in handy when I was getting started, but the most common bindings got baked in to my muscle memory surprisingly quickly. The defaults, many of which are taken from dwb, start to feel natural very quickly if you have prior experience with vi-style navigation. Most interactions with Qutebrowser are done through commands entered in the status bar. From the status bar, you can change settings, open, close, and navigate tabs, store and load bookmarks, spawn programs, and more. Almost all commands have a completion feature that will feel very familiar if you have ever used tools like dmenu or rofi. It’s difficult to convey just how useful the completion is and how efficient it feels to use. With just a few keystrokes, I can open any page in my history, list my bookmarks and open one, or look up the description of a configuration option and change its value. Chromium has a similar feature built into it’s omnibox for opening pages, but it can be difficult to open a specific page that you have in mind with it and it is not nearly as flexible as the commands and completion in Qutebrowser. This isn’t often something that I put a lot of weight on when I am evaluating software for personal use, but the aspects of Qutebrowser as an open-source project that go beyond the browser itself and the community around it have made an impression on me that I think is worth mentioning. Some of these are more common than others when it comes to open-source projects, but for me they all really add to the amount of happiness I experience when I use Qutebrowser. This is one of the main things that a web browser is all about, isn’t it? Qutebrowser does an excellent job of displaying websites, just as excellent as Chromium. In fact, it’s exactly as excellent as Chromium because both Qutebrowser and Chrome/Chromium use Google’s Blink rendering engine, so websites should look identical in the two browsers. This also means that you’ll have access to the webinspector and some of the chrome:// pages that you may be used to using in Chromium. I would bet that many of you are familiar with that sequence and know exactly what happens when I enter it. It opens a new tab and places keyboard focus in the omnibox, then it highlights a URL from my history based on some algorithm that seems to take into account the frequency and recency of my visits to that site, and then it navigates to that site (in my case, Facebook). This sequence has become muscle memory for me and I often don’t even think about it when I enter it (which is an interesting/frightening phenomenon that deserves a separate post someday). There is a small handful of websites for which these quick sequences reliably get me to the sites I want to get to in Chromium, but the algorithm that it uses is a mystery to me and often results in very different sites than what I’m looking for. Qutebrowser captures similar (and in my opinion, superior) functionality through quickmarks. Quickmarks are URLs that take priority over all other URLs in your history when completing URLs with the open command. They are identified by strings that you as a user set explicitly. For example, I have the string fb to identify https://facebook.com. This means that I can type ohn<Enter> to open up Hacker News, or Ofb<Enter> to open Facebook in a new tab. After using quickmarks for over a month now, I find them even more convenient than Chromium’s omnibox completions, because I like using o and O more than <Ctrl-l> and <Ctrl-t> and also because I have full control over the quickmarks that are set. I am using Qutebrowser as my primary web browser now, and I really do like it a lot more than Chromium, but it’s not quite perfect yet and there are a few specific things that I miss from Chromium. One feature of Chromium that I took for granted while I was using it is autocompletion in forms. In Chromium, I rarely had to manually type my whole address, email address, phone number, name, or even my credit card number, because I have given Google all of that information and the browser would autocomplete the form I was editing with it. Qutebrowser currently does not autocomplete forms. To be clear, I don’t think that Qutebrowser should make use of a centralized place in the cloud that contains all of my private info, but it would be cool if it implemented a way to store all of that info locally on my machine for form autocompletion. This hasn’t been a big issue, but it would be a nice convenience to have. This is related to the autocomplete issue, but I really miss having my passwords saved and autofilled on websites that I have to log in to frequently. This is a commonly requested feature and you can find discussion of it here. Web notifications seem to be a bit of a controversial topic among some people, but I really like them. Qutebrowser (with QtWebEngine) does not support notifications yet. Ever since I started using Chromium, I had been using it as a PDF reader as well as a web browser. It was super convenient to be able to click a link to a PDF and have it open up in a new tab, just like a website. Qutebrowser doesn’t have a built in PDF reader. PDF.js works well in it, but with QtWebEngine, downloaded PDFs can’t be opened automatically. I believe that this is being actively worked on, and it should be solved soon, but for the time being it is a bit of an inconvenience. For now, I’ve ben going back and forth between using PDF.js in Qutebrowser, and using zathura. edit: Since posting this, I’ve settled on a PDF viewing workflow that I actually much prefer to having a reader built into my web browser. I made a rofi script that lets me quickly search through all the PDFs in my home directory and sub-directories and open one in zathura. You can check it out here. In Chromium, I have the option to give Google all of my settings, my theme, my bookmarks, and my saved passwords and have them all synchronized across all my devices. Qutebrowser doesn’t have a cloud sync feature like that, but it does use a configuration file that I now include in my dotfiles git repository. This gets the job done (and is actually preferable for me) when it comes to keeping configuration in sync between machines, but version controlling my quickmarks and bookmarks and trying to keep them in sync between machines is a bit less convenient. I’d like to point out and emphasize that this isn’t a feature that I think Qutebrowser needs to add, especially since a feature like this would directly counter the philosophy of many of its users. I only mention it here to inform newcomers who aren’t familiar with Qutebrowser, since it is certainly something that new users who are coming from browsers that automatically kept configurations synchronized might miss. I had been feeling a desire to detach myself from dependence on the Google ecosystem for a while, but didn’t think I could actually ever do it because the convenience of Google products had always been too great for me to switch to anything else. The fact that I genuinely prefer Qutebrowser to Chromium is a huge surprise for me and has sparked a transition away from other Google products as well. (Drive/Photos -> Nextcloud, Google Search -> DuckDuckGo, etc.) So far I haven’t committed to those others as fully as I have with Qutebrowser, but it has been fun exploring some of the other options that are out there. I hope that this post was helpful for anyone looking to learn more about Qutebrowser. If you found any of this intriguing, you should install it and give it a try!